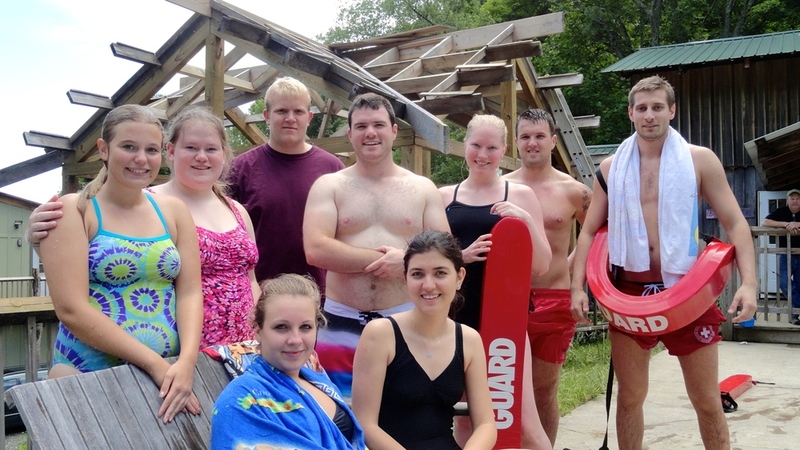 Here's a group shot of our camp counselors during lifeguard training, which began June 5th and continues with general camp training right up until the last minute, when the campers arrive on June 15th. From near and far, we're overjoyed to have a stellar team this summer and can't wait to kick things off! "When people come together for meals there is more than nourishment for the body," says local potter and friend Shane Mickey. "There is nourishment for the mind and heart." We feel the same way, and when we asked Shane if he would make serving dishes for our family-style meals at camp, we were touched by his response. "Susie worked with my son while he attended Montessori and that work enabled him to learn at a higher level," recalls Shane. "When I was approached by the camp to make the serving pieces, I considered it an honor to have my work be the presentation platform for all those fortunate campers and caring tutors and camp counselors." Shane says that family-style meals allow for more sharing, because people can gather and discuss the day's events, triumphs, and failures and therefore gain a deeper understanding of one another. Understanding yields support, and for children with dyslexia who may have self-esteeem issues due to struggles in the classroom, that support is a balm. Slow and steady, this adds up to happier children that grow into successful adults who contribute to society--most often through the innovative thinking that dyslexics are known to achieve. "To me, Camp Spring Creek is a wonderful asset to our community because it not only adds to the diversity of businesses, but what it's mission entails and what they accomplish is heart-warming and incredibly important to the broader context of our society." We're so proud to be featured in last month's print and online issue of WNC Magazine. Please take a moment to enjoy this brief feature by clicking HERE and scrolling down to Steve and Susie's photo. This week, Co-founder and Co-director Steve van der Vorst is in Krakow, Poland for the Camp America Camp Director's Fair, where he will get to hand-pick some of our counselors for this summer! "Our counselors have to be able to show initiative," says Steve. "That’s one reason we conduct many interviews...I can usually get an idea for how energetic someone is, and also, how enthusiastic. A lot of young people want to work at a camp, but most camps in America are large and hire counselors that focus on one specialty. We look for people with skills across the board and we're a small camp, so we want someone comfortable with our family-style dynamic." 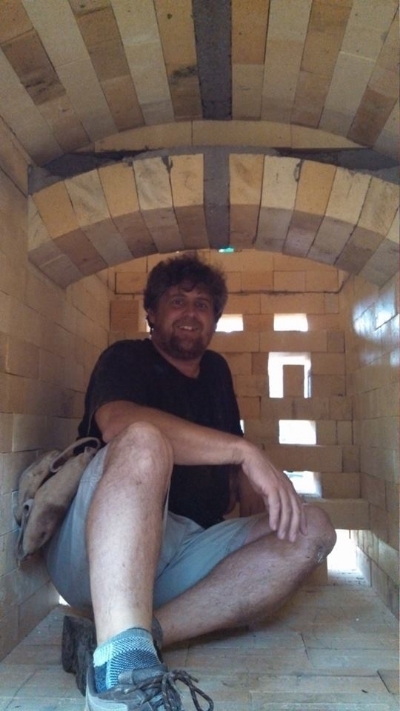 In addition to hard skills such as a background in art our outdoor activities, Steve also looks for a sense of humor, experience traveling and being away from home, and a willingness to work hard. Safe travels, Steve, and come back with lots of top picks! This press release was originally through published in Bucks County, PA area media outlets in anticipation of our 1/6/14 Camp Show in Buckingham, PA. Read below for info about hosting a camp show in your area, and also some choice quotes from Camp Spring Creek's very own Susie van der Vorst. Buckingham, Pennsylvania – January 6, 2014 – Summer camp for children with dyslexia offers film and open house. Camp Spring Creek, located in the Blue Ridge Mountains of North Carolina, is an academic and recreational camp supporting dyslexic children ages 6 to 14. Invited by a local Doyelstown family whose child attended the camp, co-founder and director Susie van der Vorst will screen “How Difficult Can This Be? The F.A.T. City Workshop” by Rick Lavoie and facilitate a brief discussion afterwards. This unique film allows viewers to experience the frustration, anxiety, and tension that children with learning disabilities face every day, as if seeing it through the eyes of a dyslexic. The event is free, open to the public, welcomes children, and includes refreshments. The academic program at Camp Spring Creek includes one-on-one tutoring using the Orton-Gillingham approach, keyboarding and writing classes, one hour of reading aloud each day to camp staff, and one hour of study skills. Optional math remediation or enrichment is available as well. The activities offered by the program include wood shop, art, gymnastics, swimming, orienteering, and waterskiing. There are also field trips to explore the surrounding Blue Ridge landscape and culture. Camp Spring Creek is one of only three residential camps in the United States accredited by the Academy of Orton-Gillingham Practitioners and Educators. The open house and film screening will be held Monday, January 6 at 7 p.m. at Trinity Episcopal, 2631 Durham Road, in Buckingham. For more information, call (828) 766-5032 or visit www.campspringcreek.org. Win a Camp Spring Creek Chair! We're holding a little contest on the blog, starting now through December 31, 2013: Like our page on Facebook and then send that page a Facebook message telling us which "Inspiring People" blog post inspired you the most. We'll enter you into a drawing to win this Camp Spring Creek chair! Use the link above to read the posts, or access them using Categories on the right-hand side bar. Be sure to tell us why you felt inspired by what you read and feel free to share this contest with friends! Anyone can enter! Winner will be notified via Facebook on New Year's Eve! Today's blog post is written by Camp Spring Creek's very own, Susie van der Vorst. Susie originally wrote this for The Fortune Academy's blog, Oaks & Anecdotes, which published it last February. Enjoy! Residential summer camps are a great way to build independence and self-confidence. Whether a child needs a shorter experience at a sleep-away recreational camp or the intense immersi on of Orton-Gillingham instruction along with the confidence boosting camp activities, there is an experience that will keep them from lagging behind in the summer. By attending an accredited OG summer program a child can not only maintain the growth he or she has achieved, but often gain in skills during the summer months, providing a springboard for success in the fall. There are three residential summer programs that are accredited by the AOGPE: Camp Dunnabeck, Camp Spring Creek, and Durango Mountain Camp. Each camp is similar, and as one who has worked at all three camps, I can briefly describe each camp. Camp Dunnabeck is the oldest camp of its kind. It was founded in 1955. At Dunnabeck the residential campers are generally ages 11-16 with day students from 6-11. Recreational activities include horseback riding, water skiing, tennis, art, and several other stimulating activities. Durango Mountain Camp was established nearly two decades ago and caters to older residential campers (11-17) who are sports enthusiasts. Along with the 1:1 OG tutoring, Durango suits the older, thrill-seeking youths who want the adrenaline rush of extreme sports to help develop creativity, enhance self-esteem, foster individual strengths and generate a great deal of enthusiasm. Camp Spring Creek is the direct result of experiences at Dunnabeck and Durango Mountain Camp. Susie and Steve van der Vorst met at Dunnabeck in 1990 and worked together there for four summers. We started Camp Spring Creek offering an approach for the “whole” child, including OG tutoring, life skills and activities such as wood shop, swimming, art, camping, hiking, water skiing, rock climbing, and archery. Often geographical location can play a large role as well. Most important is to find a place where the child feels safe and can make the most progress possible. For those living in Indianapolis, Fortune Academy’s B.R.I.T.E summer camps are a valuable option. Dear Sponsor, I have learned a lot at camp, such as the butterfly stroke in swimming and how to divide words easily, so I can read better. I am learning to make a xylophone in woodshop. I have enjoyed doing swimming and art everyday and the zipline. I could not have done a lot of stuff if I had not come to camp. I could not have gone rock climbing or done pottery or archery or met new people from all over the world and country. Thank you from the bottom of my heart. I love camp and camp is so much fun. Thank you. Dear Sponsor, I have learned a lot this summer. I learned how to hold my pencil correctly, new words, b/d's, how to read better, and cursive! I have enjoyed art. I liked working with clay. I have enjoyed woodshop where I have made my name, a book, a box, a birdhouse, yo-yo and a candy dispenser. I love playing fun games in tutoring! I made a lot of new friends. I would not have the chance to do woodshop at home or meet new people from all over the world! Thank you so, so much! This summer, camper Adeline participated in our Orton-Gillingham/Camp Counselor pilot program designed to benefit Mitchell County children. For four weeks, Adeline spent 2 hours at camp each day: one hour with her OG tutor and another hour participating in camp activities. "One day Adeline came home and for entertainment she actually enjoyed making the flashcards," said her mother Tonya. "She made me a whole set and then she asked me, 'Mom, would you buy me some more 3x5 cards?' She'd never done anything like that before. We really appreciate what Steve and Susie and Camp Spring Creek did for us." Adeline is now in 7th grade at a local school. Her parents have lived here for over twenty years and love the Western North Carolina community. "It's refreshing here. I cannot imagine raising our girls anywhere else in the world," said Tonya. "We appreciate having a yard and such a beautiful view and land for animals and a garden. We have fruit trees, fresh asparagus, fresh flowers...We love it here." This article was originally published in local papers. Spruce Pine, North Carolina – Camp Spring Creek of Mitchell County and OpenDoors of Asheville join forces to make a difference in the lives of four Western North Carolina children. This summer, four Buncombe County children connected through OpenDoors of Asheville were awarded full scholarships to attend Camp Spring Creek, an academic and recreational camp focusing on literacy, language, and math skills. Located in Bakersville, the camp has served children from WNC and around the world for 11 years and is one of only three residential camps in the United States accredited by the Academy of Orton-Gillingham Practitioners and Educators. OpenDoors connects local children living in multi-generational poverty with enrichment and education opportunities to help break the cycle of poverty. The organizations teamed up to provide jointly-funded scholarships made possible through private donations, enabling four children from Buncombe County to attend Camp Spring Creek for four weeks at a total value of $29,920. As a part of their study hall sessions at Camp Spring Creek, campers write letters home. The OpenDoors campers also wrote thank you letters to “sponsors” whose donations made the scholarships possible. “I am a better reader now and I met new people,” wrote one 7th grade child, “Thank you for helping me come here.” Another camper, age 10, wrote: “My reading is improving. My tutor is cool and she taught me cursive. I have made lots of friends here and some of them are from different places.” Their letters also included positive responses to new experiences they had at camp, such as whitewater rafting, paintball, swimming lessons, and woodshop. For more information about services from OpenDoors, residents of Buncombe County can call 828-777-1135 or visit opendoorsasheville.org. For information on teacher training, camp, or tutoring opportunities through Camp Spring Creek, call 828-766-5032 or visit www.campspringcreek.org. Thank you for helping me to go to camp. I love to go camping now. I learned how to read better. Also, tapping helps with my spelling. I did not know that you could make so many things out of wood. Thank you so much. Thank you for my time at camp. I have made lots of friends and some of them are from different places. My tutor is cool and she taught me cursive. We learn new things everyday. My reading is improving and my tutor is making reading a lot easier and all this happened because of OpenDoors and Camp Spring Creek. Thank you for helping me come here. I am having so much fun at this camp. I'm really glad. I came to do whitewater rafting at this camp. I am a better reader now and I met new people. Thank you. This summer, camper Zachary participated in our Orton-Gillingham/Camp Counselor pilot program designed to benefit Mitchell County children. For four weeks, Zachary came to camp for 2 hours each day: one hour spent with his OG tutor and another hour spent participating in camp activities. "This was Zachary's first time attending a camp like this," said his mother Meredith, "and before it started he was already looking forward to it. He finished and said he hopes to return. We are so grateful and appreciative of the opportunity he was given.” Zachary, who is in 4th grade, worked with Lilja, who was a trained OG tutor and our camp lifeguard. “I had a great time," he said. "I learned a lot of stuff. I even learned how to swim.” Zachary also came home raving about his experiences in Woodshop and trying out the zip-line. Ben is 10 years old and first attended Camp Spring Creek in 2012. In 2013, he and his family were delighted that he would be able to come back. Unfortunately, a change of plans in late spring prevented Ben from being able to attend. Ben and his family decided make his camp spot available to a Western North Carolina child. The silver lining is that, not only did a Mitchell County child get to experience Camp Spring Creek for the first time, but Ben will be able to return next summer. We can't wait to give him a warm welcome back! Of his experience at camp last year, his mother shared: "Ben had a really great time. It was important for us to find a camp where he could continue the academic work he focused on during the school year, but still also be a kid. The thing we noticed the most was that his handwriting had vastly improved. He also gained a lot of confidence in reading." This testimonial came our way from Kay Oliver, parent of 4-week camper, Chase. Chase came to us as a reluctant camper, and had a complete turnaround. He loved his time at Camp Spring Creek! In fact, when he got home, he decided that he was ready to move on from homeschool and apply to...[read on!]... I want to thank you for making this one of the best summers ever for Chase. Your camp and counselors and tutors, especially Lissa Jo, have restored our hope for Chase’s education. Chase’s progress exceeded all of our expectations. We are thrilled that he has a new desire to learn. His confidence continues to amaze us. We have decided to apply for admission to The Kildonan School. Chase has told us he really wants to attend. We are so thankful for all of you. We're taking a week off (the blog). But posts will resume with a twice weekly schedule (occasional exceptions) next week. Thanks, as always, for following along!